The world lost a wonderful human being today. He overcame so much in his life, and in spite of everything that was done to him, he refused to become bitter, angry, and vengeful. Instead he chose to embrace forgiveness and positive action. He was a truly inspirational person. 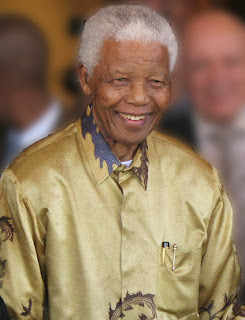 Thank you, Mr Mandela. Photo of Mandela from 2008 - source South Africa The Good News.